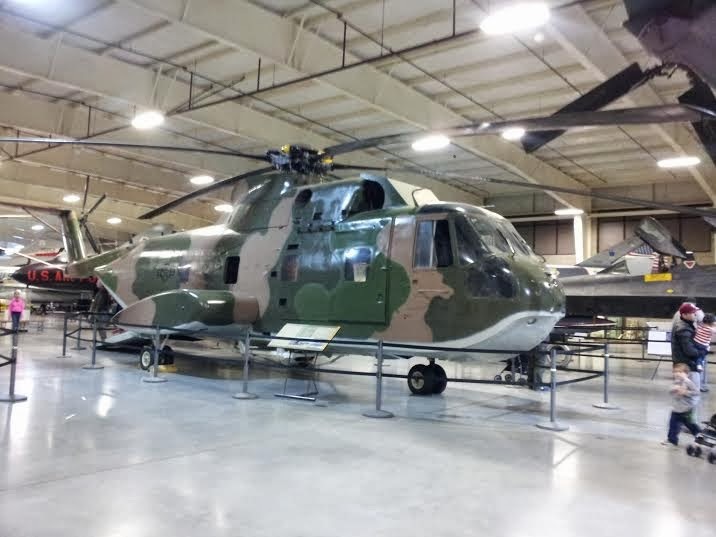 We've been meaning to go to Hill Air Force Base Airplane museum for a few years now. Saturday was another cold, rainy day. We woke to discover a leak in our apartment. While Char tried to figure out what was going on and try to save our living room I figured today would be a good day to get out of the house with Heidi Anne. 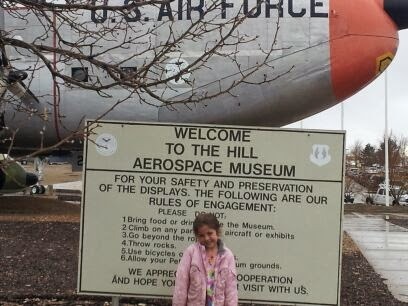 When I told her we were going to have an adventure and go to the plane museum she started jumping up and down. She was saying "I LOVE it when your friend Valerie comes and visits! I can't wait to see the twin girls! We're going to have so much fun!" I kept telling her that Valerie wasn't coming today, she lives far away. That didn't stop her asking or telling me "Mommy, we have to wait for your friend. They'll get lost if we go to far ahead." As soon as we pulled in Heidi Anne noticed something. The airplanes outside the building have picnic tables under the wings. There were a lot of planes outside. We were both sad that it was to cold, rainy, and we didn't know we could have a picnic there. She promptly declared "Next time we come, we are bringing either Kayliah and her family or your friend Valerie's family. We are going to see ALL the planes outside and eat under the neat planes." I was surprised at all the planes they have there! Everything from models of the Wright brother's planes to F-16's. Most of the materials have been donated, things from uniforms, documents, planes, ect and the displays recreated to great detail. 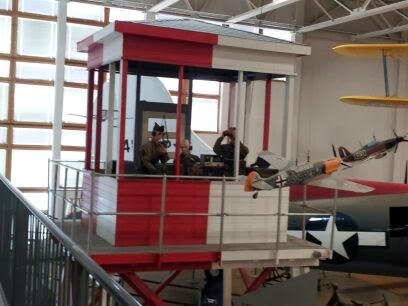 Heidi Anne thought it was fun that you could go up a balcony and have the air control tower with uniformed dummies from WWII looking back and pointing at you. There are a number of WWII model airplanes surrounding it. Heidi Anne thought they were real people at first and started waving to them. Sadly, both my phone and camera died while we were still in the first half of the first gallery. Which only covered the end of the European Theater of WWII. They had a section showing women in WWII. On this plane only women are shown making repairs / flying the planes to the ports. Heidi Anne would point out the "lady fighters" when we would come near the area. There were lots of planes and displays. Right up to the current war. They had a Blackbird! I was telling Heidi Anne how the HUGE jet we were looking at was once a top secret plane. She looked at me and asked "Who do you keep a GIANT plane like that a secret? Didn't the news just tell everybody? Were the people working on it blind? How did they not tell anyone?" This elderly man nearby chuckled and then told her "People were asked not to tell and they kept their promise, otherwise lots of people could have been very hurt." Heidi then told him "I bet they didn't have new people then. They tell everything." Which got more laughter and a "Out of the mouth of babes." We are going back in a bit. We barely got through the Korean war before she started to tire out. 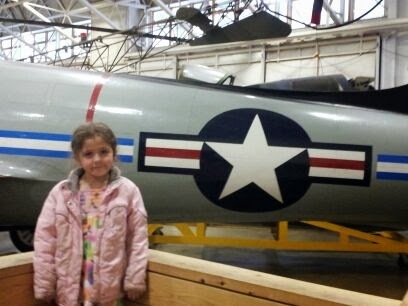 She wanted to go see the big jets and helicopters, and anything with pictures or "people"around them. I know we missed seeing a lot of planes. At least it's free. Oh, and one thing caught her eye on our way out. On our way out she saw this red phone box, ran to it, froze, she seemed so disappointed. I asked her what was wrong. She looked at me and said in a sad voice "It's the wrong color. It should be blue, the TARDIS is a BLUE phone box." I told her "Well sweetie, that's how people tell the difference between a real phone box and a tardis." She perked up, then looked at the man inside it and told him "That's not the Tardis. It's just a phone. Mommy, when are we coming back?" PS. We still have that leak. No one can seem to locate it. Anyone have a wet / dry vac or something we could borrow?